I have a couple of automotive fetishes. One is for Aston Martins. The other is for hot rod wagons. Hey look, here's an Aston wagon. Today is a wonderful day. The car in question is a Rapide that has been modified by Bertone to become an Aston Shaggin' Wagon. 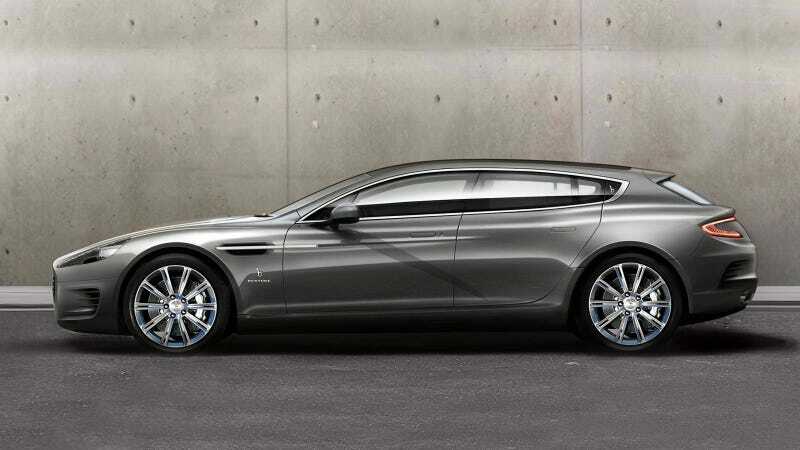 Technically, it's called the Aston Martin Rapide Bertone Jet 2+2. I think the name I chose is eloquenter (more eloquent?). Running gear is unchanged, which means it has the same 476 horsepower V12 under the hood and rear-wheel drive at the back. Since it's based on the latest Rapide S, the Aston wagon has that new, huge grille. But I don't care because Aston wagon. The problem is that only one is being built. It was commissioned by a collector that wanted to celebrate Bertone and Aston's long history of working together. Sounds like my type of car guy.